OTTO eyewear is designed for everyday wear. They are ultra wearable and complete your look for every occasion. You will find a pair of OTTO glasses that fits your unique style. 1. PL(Plano): this means that there is no correction needed (0.00). 2. Pay close attention to plus (+) and minus (-) signs. 3. 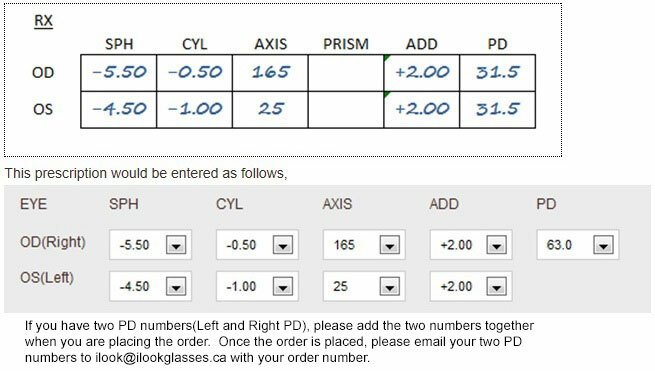 "100" is equivalent to "1.00"
CYL(Cylinder): The strength of your astigmatism. Axis: The rotation cylindrical lens to correct your astigmatism, from 1 to 180 degrees. 3. Axis of "010" is equivalent to "10"
This value represents the amount of additional correction needed to focus at close distances. 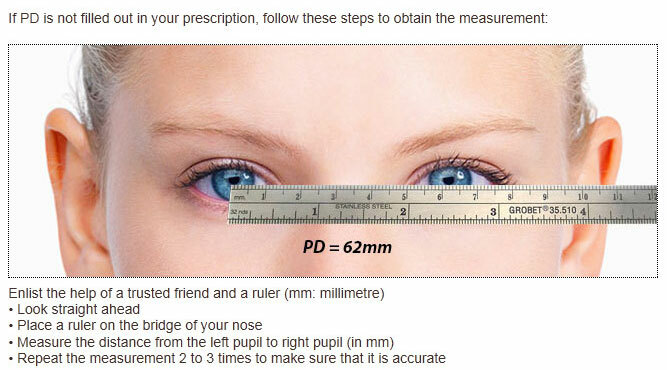 PD is the distance between the centres of your pupils, measured in millimetres. Please double check your prescription to see if it's indeed Plus(+) on one side and Minus(-) on another. Please double check your prescription to see if the CYL(Cylinder) indeed has a Plus(+) sign. How do I enter my prescription? How do I enter my prescription? How do I enter my prescription? What if PD is not on my prescription? - Special order item. A $15 restocking fee will be charged on returns or exchanges. - Special order item. A $25 restocking fee will be charged on returns. Lenses that darken with the exposure to sunlight. Note: lenses will not darken in cars as windshields block UV rays. For driving, select Sunglasses Lens. - Special order item. A $35 restocking fee will be charged on returns. - Special order item. A $45 restocking fee will be charged on returns. UV Protective Coating shields your eyes from harmful UV rays. Scratch Resistant Coating minimizes the occurrence of minor scratches on the surface and improves the durability of the lenses. Anti Reflective Coating reduces glares and minimizes eye strain. This coating is important for extended computer use and nighttime driving. The most affordable way of getting your prescription sunglasses. Save upto 55% with Deluxe Coating Combo - UV Protection + Scratch Resistant. Save 55% with Deluxe Coating Combo - UV Protection + Scratch Resistant + Anti Reflective. UV Protective Coating shields your eyes from harmful UV rays. Scratch Resistant Coating minimizes the occurrence of minor scratches on the surface and improves the durability of the lenses. Anti Reflective Coating reduces glares and minimizes eye strain. This coating is important for extended computer use and nighttime driving. 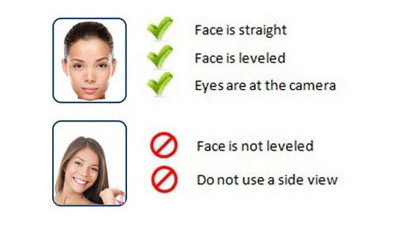 Applicable when Cylinder(CYL) in your prescription is between -2.25 and -5.00, or when the combined value of Sphere(SPH) and ADD is between +3.25 and +6.00. This is a non refundable fee. 2. You like the fit of the frame. But it just doesn’t look right on your face. 3. Pistachio green was so last week. You no longer want to wear green frames. 4. You like everything about the frame. But your wife doesn’t. In short, if you are not 100% satisfied with your purchase for any reason, simply return your purchase. Enjoy FREE SHIPPING on all orders over $60. 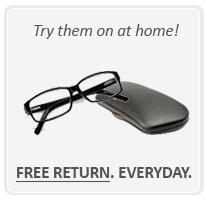 If you are not 100% satisfied with your glasses for any reason, simply return your purchase. Return shipping is on us! ZOOM Click "+" or "-" to adjust your photo. PD mmPlease mark L and R pupils and enter PD below. XLogin or Creative account to save picture.